Fans of Walt Disney Pictures' animated comedy "Lilo & Stitch" know him as a cuddly but destructive alien prone to hilarious fits of havoc. But what was Stitch like before the movie? 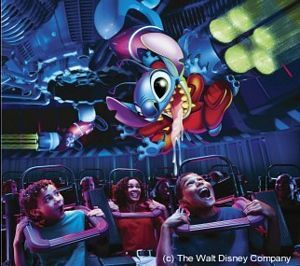 Walt Disney World guests find out when they come face to face with the mischievous character in a new Magic Kingdom attraction -- Stitch's Great Escape! This attraction contains loud sounds, bright lights, and segments in total darkness. Some young children might find it scary so it might be one to skip if the above are likely to cause problems. Lilo and Stitch are often found nearby the attraction, so keep your autograph books handy. The building which houses 'Stitch's Great Escape' has seen many changes down the years. It first opened as 'Flight to the Moon' in 1971 as one of the Magic Kingdom's original attractions. In 1975, it became 'Mission to Mars' and after another imagineer rethink, it re-opened in 1994 as 'ExtraTERRORestrial Alien Encounter'. However, it was thought this version was too intense for kids and so yet another rehab was ordered and Stitch moved in, in the hope the concept would seem less intense. The figure of Stitch is one of the most advanced Audio-Animatronic figures ever created by Disney Imagineers. Its also the first AA to spit! Walt Disney Feature Animation produced all of the attraction's character animation. Many of the animators who worked on "Lilo & Stitch" partnered with Imagineers for Stitch's Great Escape. Guests will be confined by a restraint system that applies pressure to the head and shoulders. Persons who develop anxiety in dark places or those with neck or shoulder conditions should not experience this attraction. Certain special affects may be too intense for some Guests. Guests using electronic medical devices that may be affected by electromagnetic fields should not enter this attraction. As you wait in the queue, take a close look at the alien "hieroglyphics" on the pole.